A black and white medium format negative of Brian Winter presenting a Canada clock to Mayor Martin at a Council Meeting on December 13, 1963. This Canada clock was made in Whitby circa 1872 and was discovered in a local Antique shop. Brian Winter and the Town of Whitby jointly purchased the clock, paying $20 and $10 respectively. The clock was a 30 hour O.G. weight strike in a veneered wood case. 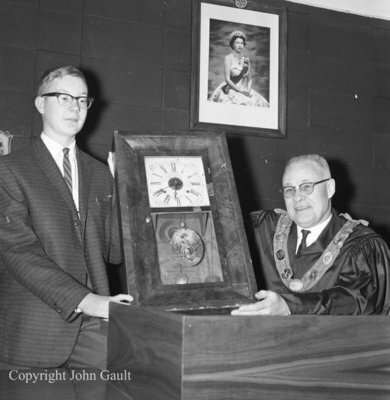 Mr. Winter presented the clock to Mayor Martin on Friday, December 13, 1963 at a council meeting. The Canada clock hung in the Centennial Building for many years. The Canada Clock Company was located on the southeast corner of Brock and Colborne Streets. The factory was the first clock factory in Canada. Originally owned and operated by the Collin brothers, (William F., John F. and Edward) in 1872, the Canada Clock Company Factory operated in Whitby until 1876 when the equipment was sold to a new clock company in Hamilton, Ontario, the Hamilton Clock Company (Varkaris, Jane et al., The Canada and Hamilton Clock Companies. Erin: The Boston Mills Press, 1986). Donation of Canada Clock, December 13, 1963, John Gault. Whitby Archives A2014_015_001. Scanned from a black and white medium format negative.